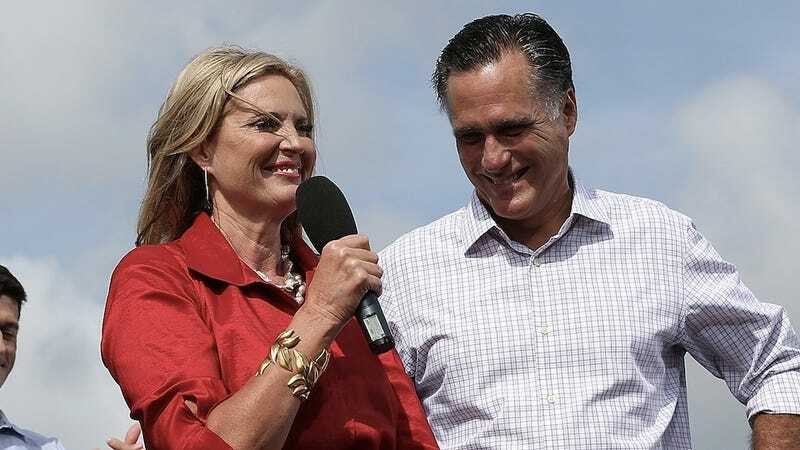 Ann Romney showed a little fire last night during a radio interview in Iowa, responding to her husband's critics by saying, "Stop it. This is hard." Romney's terrible, horrible, no good very bad week started when a secretly recorded videos of Mitt Romney accusing everyone who doesn't pay any income taxes of being a lazy freeloader, kicked into high gear when he lumbered onto a Univision set wearing unusually dark brown makeup, and ended just today, when Romney released his 2011 tax returns, which show that although he made almost $14 million last year, he only had a 14% effective tax rate. Some guy who works for him swears up and down that for the last 10 years, Romney has paid an average of a 20% tax rate. Stop it. This is hard. You want to try it? Get in the ring. This is hard and, you know, it's an important thing that we're doing right now and it's an important election and it is time for all Americans to realize how significant this election is and how lucky we are to have someone with Mitt's qualifications and experience and know-how to be able to have the opportunity to run this country. I've seen better from you, Ann. C-. Please see me after class.